Book a FREE laser consult and we will tell you why! BOOK your FREE laser hair removal consultation and we will tell you why now is the best time to get in for your consultation. We are looking for our next super star! Do you want a career as a therapist in the skin and beauty industry? Have you already started a career in the skin and beauty industry? 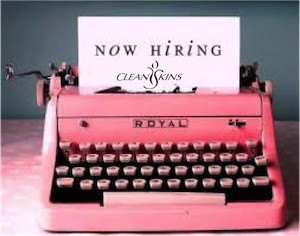 Are you passionate about all things skin and want to help clients achieve their skin goals? CLICK HERE to for details of this entry level career opportunity. Club memberships strictly capped at 10 members! Regular clients get the best results sooner + we reward them with the best savings! Start your journey to great skin! New Skin Client introductory offer! I want to shave, wax & sugar for ever, said no one ever! 5 Reasons to Get a derma CIT Treatment ASAP! I had 4 treatments. My Expectations are well above expectations. It is a great experience and don’t change anything. 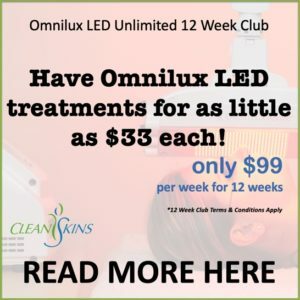 I love CleanSkins Laser Clinic! I’ve had 3 treatments and I’m basically hair free. You choose how you age, but we can help you with that! 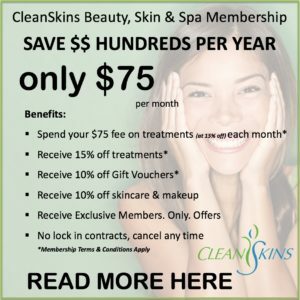 At CleanSkins Skin Clinic we offer long term solutions to correct, repair and maintain you skin. All of our products and treatments are proven and tried & tested over time. We don't 'jump on the band wagon' of 'too good to be true' quick fixes, and we certainly don't believe salesmen without first backing up their promises with our knowledge of skin physiology and the physics of their recommended equipment. To that end we are never forced to sell treatments that just don't give optimum results, simply because we had incorrectly purchased inferior or incorrect treatment modalities. We offer treatments to correct skin conditions, skin imperfections and to reduce the visible effects that our lifestyles and the ageing process have on our skin. We never promise results that we can't actually achieve. Our solutions will take time, but they will be long term and noticeable. The reason your results will take time is simple really, most likely your skin concerns didn't happen over night, so the solution won't happen over night! We offer solutions for acne, rosacea, perioral dermatitis, pigmentation, fine lines and wrinkles and over all anti-aging reduction and prevention. The first treatment you will need is a skin consultation which is the first step to the best skin you can achieve. "Our guarantee to you is that we will be honest, ethical and informative. We will not make promises that we can improve your skin unless we actually can!" Every skin and lifestyle are different and deserve a treatment plan tailored specifically to combat individual skin concerns. A CleanSkins therapist will conduct a comprehensive analysis utilising our knowledge and diagnostic equipment. We will not only assess your skin but also the causal factors of any skin concerns or conditions you may have. At the completion we will provide you with advice, and a comprehensive treatment plan which may include; • An in clinic treatment plan • An appropriate homecare program for you to follow • Referrals to other medical professionals, skin specialists or treatment modalities In preparation for a skin analysis consultation, please bring all of the skincare products you are currently using: including medications, herbal supplements and makeup. This consultation is the first step to fresher, more radiant and flawless skin! Have your first facial treatment with your skin consultation. Allow 65 minutes for this treatment. Every skin and lifestyle are different and deserve a treatment plan tailored specifically to combat individual skin concerns. A CleanSkins therapist will conduct a comprehensive analysis utilising our knowledge and diagnostic equipment. We will not only assess your skin but also the causal factors of any skin concerns or conditions you may have. At the completion we will provide you with advice, and a comprehensive treatment plan which may include; • An in clinic treatment plan • An appropriate homecare program for you to follow • Referrals to other medical professionals, skin specialists or treatment modalities In preparation for a skin analysis consultation, please bring all of the skincare products you are currently using: including medications, herbal supplements and makeup. This consultation is the first step to fresher, more radiant and flawless skin! During this treatment we will: 1 Conduct a full skin assessment using our knowledge as well as skin diagnostic equipment 2 Discuss any skin concerns or conditions that need correction and offer solutions and/or referrals 3 Educate on how to maintain healthy, glowing skin and ultimately minimise the environmental effects that damage our skin over time 4 Teach them how to use and apply skincare and makeup 5 Where recommend provide a suitable home care and/or in clinic treatment plan This treatment is aimed at education and prevention not simply our product sales! It is a standalone treatment that will give your teenager/young adult the tools and knowledge to have the best skin that they can! Note: limited to 1 per individual. 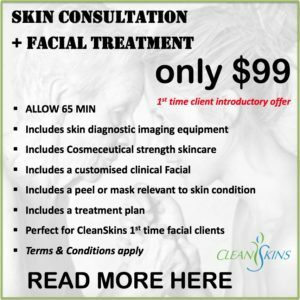 CleanSkins offers 30, 45, 60, 75 or 90 minute Dermavidual facial treatments which are individualized to your skin requirements. Dermaviduals is a German custom blended cosmeceutical skin care range that is at the forefront of skin treatments in the world today. 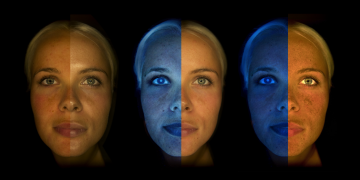 It reaches deeper layers of the skin than the majority of skincare available today. Most importantly it is free of ingredients that are known to desensitise the skin ….learn more about Dermaviduals. With Dermaviduals our therapist have the ability to tailor and custom blend products specifically to your individual skin concerns. We block out the time we need and from there we individualise each treatment for each client. We compound masks, peels & serums during our treatments. This range will change your skin! Book in with one of our Skin Therapists for a skin consultation or facial treatment and see how amazing this range is. Custom blended Dermaviduals 45 minute facial which includes a blue, revive or plus Omnilux™ LED treatment. This facial reaches way deeper than a therapists hands can on their own and is excellent for acne, rosacea, skin rejuvenation & skin health.